Vitamins & Supplements Professional Vitamin Shop Vitamins & Multi Vitamins Pure Encapsulations Vitamin D3 1,000 I.U. 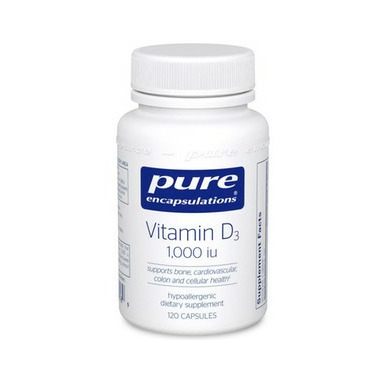 Pure Encapsulations Vitamin D3 1,000 I.U. Pure Encapsulations Vitamin D3 enhances calcium absorption and retention, a key nutritional role in supporting healthy bones, and may play a potential role in cardiovascular, colon and cellular health. Vitamin D levels have been shown to decline with age, due primarily to a reduction in either absorption or metabolism by the liver. Decreased exposure to sunlight, a vegetarian diet, or a low intake of vitamin D fortified foods also play a role in inadequate vitamin D levels.